Solana Jolly, a senior at Windsor High and co-president of the “Green Team,” recently organized a “Green Week” as her senior project. The week was supported by the staff of the Center for Climate Protection’s ECO2school program. Green Week engaged students in activities geared towards encouraging a shift in how students get to and from school. Over 850 Windsor High students participated by either walking, biking, skating, taking transit, or carpooling. The week kicked off with Motivation Monday, which included a bike blender set up during lunch so that students could pedal their way to delicious organic smoothies. Students had fun getting comfortable on the bike while also rewarded with a refreshing berry beverage, mixed by their own pedal-power. Next up, Textless Tuesday, where students who signed a “Don’t Text and Drive” pledge received a scoop of ice cream from our generous sponsor Straus Family Creamery. For Walking Wednesday, students met at the Windsor Town Green for coffee and bagels and then walked to campus in a group. Walking to school is enjoyable with friends and treats, as the smiles of the participants revealed. Thursday’s theme was Cocoa4Carpools where students who carpooled or took transit to school received a cup of hot cocoa when they arrived on campus in the morning. The last day of Green Week was Fun Friday! 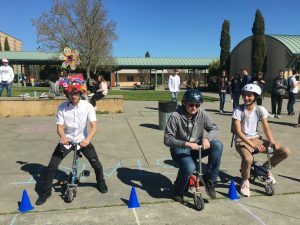 As the name implies, this final day was full of excitement with a lunchtime rally of small bike races, a guaranteed giggle watching students compete to the finish line on tiny bikes built for a clown! Students received free helmets to decorate and wear during the game, which added a colorful artistic flair to the festivities, as well as kept participants safe.